Jodee is thoughtful, a good listener, dependable and true. 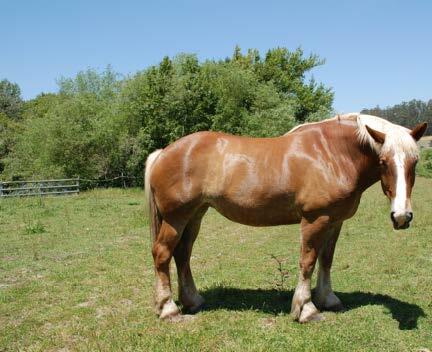 This magnificent Belgian Draft horse arrived from a Canadian ranch that extracted the urine of pregnant mares as estrogen therapy for women in menopause. Once scientists discovered that this type of estrogen was causing cancer and heart disease in women, hundreds of PMU (Pregnant Mare Urine) horses – stallions, mares and foals – were offered for adoption or faced slaughter. Jodee, Christee and Tessa were adopted together by The Flag Foundation in December 2007. Jodee thankfully was not pregnant. Jodee didn’t allow us to touch her for nearly a year. Now she is gentle and friendly, and we can’t keep herout of the grain cart. Jodee is the darker and the taller of our two draft mares and has a narrower blaze than the other.